DEA Special Agents and local police seize steroids. The Controlled Substances Act of 1970 (CSA) assigned legal authority for the regulation of controlled substances to the DEA. The statute charges DEA with the prevention, detection, and investigation of the diversion of controlled substances from legitimate channels, while at the same time ensuring that adequate supplies are available to meet legitimate domestic medical, scientific, and industrial needs. The DEA Office of Diversion Control has launched many successful operations over the years to arrest traffickers, seize illegally obtained assets, shut down rogue pharmacies and ensure that the sale of counterfeit or black market products is halted. Some of the most significant of those operations are presented in this section of the exhibit. DEA inflicts upon the illicit drug business what every legal business fears: escalating costs, diminishing profits and unreliable suppliers. DEA has dismantled major pharmaceutical trafficking and distribution organizations through criminal investigations. Used too, is DEA’s regulatory authority, subjecting registrants to significant civil fines, licensing restrictions or even suspended registrations. In 2006 DEA employed 621 Diversion Investigators who initiated 3,152 cases, seized 3,777,926 dosage units of controlled substances, seized $27,114,749 in assets and worked 672,393 case hours. The DEA Office of Diversion Control works very closely with the DEA Office of Forensic Sciences and their network of testing laboratories across the United States. During any major operation or investigation, Diversion sends samples of seized prescription medicines and precursor chemicals to the labs for analysis. DEA Diversion learns a great deal from the lab analysis, helping close a case or identify other individuals for investigation. What began in 1916 with one “chief chemist” has today evolved into a nationwide network of eight regional accredited laboratories. DEA scientists analyze most drug evidence seized by DEA and other federal, state and local police agencies. Protected by a fume hood and eyewear, forensic chemists perform special tests to analyze drug samples seized by DEA during an operation. The results of those tests will tell DEA a great deal about the drugs seized, including where they came from and how they were made. 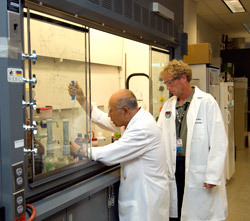 Chemical tests and analysis done in these labs help the Office of Diversion Control identify diverted prescription drugs and precursor chemicals. DEA forensic scientists use a mixture of high tech and low tech equipment to do drug sample analysis in support of prescription drug diversion operations. High Performance Liquid Chromatography (HPLC) is a commonly used analytical technique in the DEA laboratory system. HPLC can separate components in a liquid medium under high pressure with the use of specialized chromatographic columns. DEA forensic chemists have researched and developed a wide range of HPLC instrumental methods to screen, identify, and determine the purity of controlled substances in a variety of evidentiary materials submitted from DEA Special Agents, Diversion Investigators, and other law enforcement personnel.